Join the National Capital Area Chapter (NCAC) of the American Society for Public Administration (ASPA) for our Annual Meeting & Awards Reception. 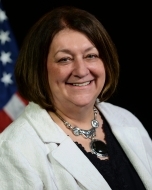 Dr. Nancy Potok was the Deputy Director and Chief Operating Officer of the U.S. Census Bureau. She previously served at the U.S. Department of Commerce as Deputy Under Secretary for Economic Affairs, the Census Bureau’s Associate Director for Demographic Programs, and the Principal Associate Director and Chief Financial Officer in charge of Field Operations, Information Technology, and Administration during the 2000 Census. Dr. Potok is an adjunct professor at The George Washington University, an elected Fellow of the National Academy of Public Administration (NAPA), and a recipient of numerous awards, including The George Washington University Trachtenberg School Distinguished Alumni Award and the Arthur S. Flemming Award. She has published numerous articles on governmental management topics, and has presented papers, lectures, workshops, and classes in both national and international forums. Dr. Potok earned her B.A. from Sonoma State University, M.A.S. from the University of Alabama, and Ph.D. from The George Washington University.